Gloria Hunniford, Angela Rippon and Julia Somerville launch a special week of live episodes of the popular consumer series. Gloria relives for the first time her own recent experience of being scammed, investigating how a woman posing as her was able to walk into a bank and get easy access to thousands of pounds. Are the banks doing enough to keep our money safe? Also in this episode is advice on beating cold callers, TV and radio presenter Jeremy Vine reveals his consumer secrets, and there is the latest on some of the biggest stories the programme has featured in the past. 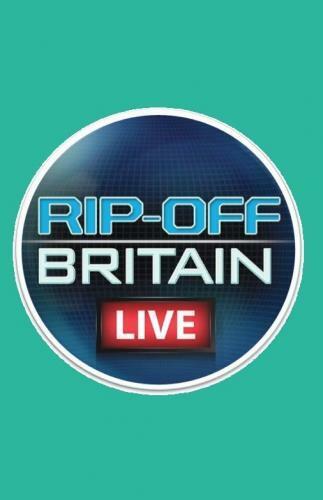 Plus, outside the studio, viewers' questions and problems are tackled by the experts at the Rip Off Britain pop-up shop. Gloria Hunniford, Angela Rippon and Julia Somerville present a week of live episodes of the popular consumer series. As a generation of women come to terms with a dramatic change in when they might be able to retire, former pensions minister Ros Altmann blows the whistle on why she feels thousands of women have been badly let down by the government's handling of the situation. Also, Star Wars actor Mark Hamill reveals his consumer secrets and, as the latest voice recognition technology is put to the test, is there a knack for making sure your commands have the desired effect? And there is more advice from the experts outside the studio at the programme's pop-up shop. Gloria Hunniford, Angela Rippon and Julia Somerville present a week of live episodes of the popular consumer series. This episode looks at an email hacking scam conning people out of hundreds of thousands of pounds, as one woman explains how she lost the entire value of her new home when fraudsters posing as her solicitor managed to convince her to transfer money into their account. Plus the unexpected holiday visa problem that risks leaving one family grounded, and there are more problems sorted by the experts at the programme's pop-up shop. Gloria Hunniford, Angela Rippon and Julia Somerville present a week of live episodes of the popular consumer series. The team meet Lord Michael Grade, chair of the new charity fundraising regulator, to see how he plans to tackle the aggressive tactics used by some organisations. And with tens of thousands of holidays ruined by the collapse of one of the industry's biggest names, travel expert Simon Calder has advice on how best to protect yourself when booking a holiday. Plus Breakfast host and Strictly star Naga Munchetty reveals her consumer secrets, and the team explores frustrations at not being able to talk to an actual human being when you have got a complaint. Gloria Hunniford, Angela Rippon and Julia Somerville present a week of live episodes of the popular consumer series. In the final programme the team look at the continuing controversy around the tumble dryers in UK homes at risk of catching fire, and they meet a family who lost everything when their appliance went up in flames. Plus, with an increasing number of goods now sold without any sort of instruction manual, the team meet people driven to distraction by the lack of advice when they have bought something new. Also in this episode is an update on some of the biggest stories the programme has investigated in the past, and more problems are solved by the experts at the pop-up shop.